5 years ago, I was trail running for 2 hours at a time twice a week along the fire trails in the Blue Mountains National park. This was a massive achievement as I had never been much of an endurance athlete, and this was a goal I set myself and I loved this style of running. A serious back and hip injury later I chose to give up running to preserve my joints. There was an incredible sense of loss choosing to not run anymore, but, a hip replacement was not the exchange I wanted to make at age 40 to continue to run. Then,12 months ago my ongoing and seemingly increasing pain and fatigue symptoms lead to the diagnosis of an autoimmune disorder. I wasn’t entirely happy with that news either. We all hear how important exercise is. We see it in our text books and turning up in our newsfeeds. Exercise is a great ‘drug’. Its benefits are incredible. Imagine my disappointment when exercise lead to a disabling migraine. And a migraine that lead to being bedridden for a day or two. Not once, but many times. The cause and effect were indisputable. I tried to exercise migraines away by doing more exercise. This is just increased the pain and the recovery time. Swimming. Walking. High impact. Low impact. It didn’t matter. Anything that raised my heart rate for more than 20 mins would result in the migraine. I became scared of my body. My GP would say – just keep trying. I kept trying and my need for strong medication kept growing. Not being able to engage with my family because I had exercised for 20 minutes seemed ridiculous. Not being able to work for 2 days. Not being able to prepare food. Is a really high price to pay for 20 minutes of exercise. However, as a health professional I know the health benefits of exercise. I’ve read the research, I’ve spoken to people who know more than I do, who I trust. I’ve done the Googling; I’ve sought the advice of experts. Exercise is necessary was the message I was getting. Let me assure you, this led to more feelings that I was failing as a health professional and as a person. And yes, I did go through the whole – is this all in my mind, am I making this up to avoid exercise self-talk. The short answer is no, I was not. How then, do I make sense of the need for exercise, while not wanting to hurt so much while, wanting to enjoy my body and enjoy my work and my family? Surely, I don’t have to chose one thing over all the others? What would I ask my client’s to do? I would ask them to work with me on identifying what is important to them. So, I examined what is important to me. My function is important. My work, my family, my ability to drive are all important. However, preserving my health is important. What is more important? How do I make that decision? The answer came to me as I’ve done more and more research for clients participating in the PurpleCo Fatigue Management program. Exercise is not the answer. Movement is. Exercise is a subset of MOVEMENT! Hey Jo, isn’t that just semantics? Move more – I can do. I can walk for 20 mins. I can do this almost daily (at the time of writing this post I am up to 2x per week) I can do a 90 minute yoga class (I am doing this 2x per week). I can enjoy walking and moving in water (as opposed to swimming 20 laps and achieving a new PB). I may not be the ‘fittest’ I have ever been, but I can assure you I am the healthiest because all of me is being taken care of. I’m removing the fear I have of my body. I’m feeling the joy of being purposeful and mindful when I move. I’m enjoying the fact I can move. I’m choosing to focus on what I can do and what is important to me now, at this stage of my life. So, if you or someone you know is struggling with a fatigue or pain condition that makes exercise difficult please don’t despair. Just set the intention to move more and find someone who can help you sort through all the conflicting demands and priorities to help you decide where to spend your time and energy in a way that nourishes and supports you. Jo is all about connecting people to purpose through inspiration and innovation. 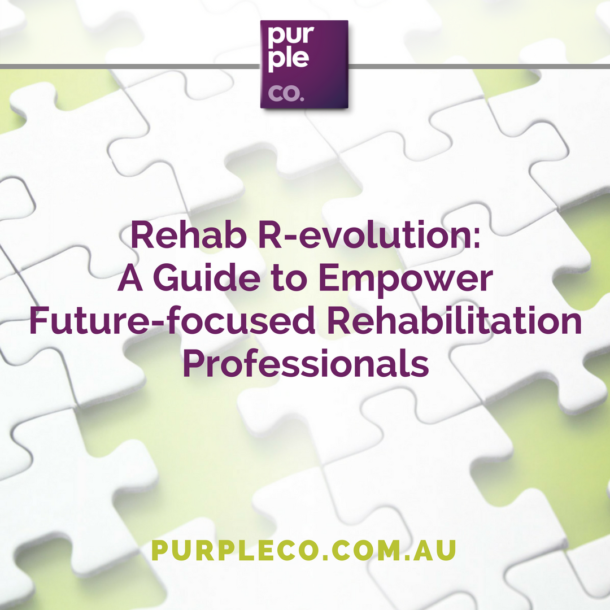 Author of The Entrepreneurial Clinician, she is also the Founder and Principal Consultant of Purple Co a team of specialist allied health consultants dedicated to helping people who experience injury illness and trauma reclaim their lives through work. Jo is passionate about the health benefits of work and truly believes that everyone has the right to meaningful and rewarding employment. Purple Co grew out of this belief as a truncated form of PURpose for peoPLE.